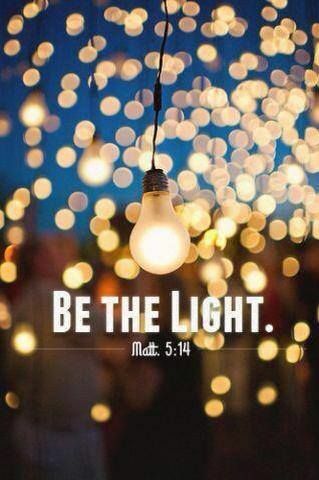 Matthew 5:14 tells us that WE, as Christians, are the light to the world! DID YOU KNOW: where there is light DARKNESS MUST flee. As Christians, we bring the 'light' of Jesus EVERYWHERE we go! When you walk into work, you're bringing the light! When you go to the grocery store, you're bringing the same light! Lights don't have to try to make the darkness leave, they just do it. It's what lights do, they extinguish darkness. People like the light, people NEED the light! You have JESUS CHRIST living inside of you! Because of what HE did on the cross you are now the RIGHTEOUSNESS OF CHRIST! You ARE THE LIGHT, it's your very nature! Keep shining for Jesus wherever you go! The darkness IS fleeing at the sight of you!